Exuding the signature elegance of Maurice Lacroix, this smart Swiss made timepiece is crafted with a stainless steel case and sleek sunbrushed matching dial. 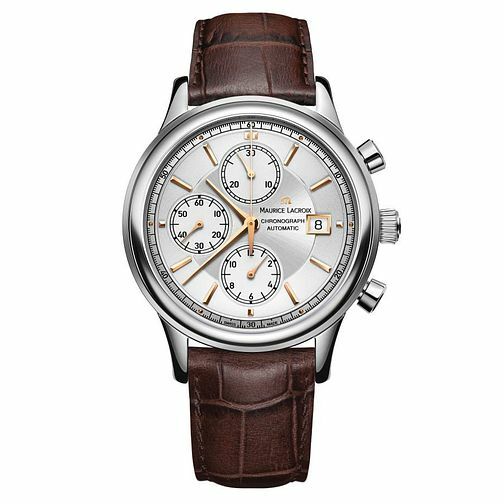 Powered by automatic movement and complete with chronograph and date window at 3 o'clock, this watch is finished with a classic brown croc leather strap. Effortless sophistication for the modern gentleman. Maurice Lacroix Les Classiques Men's Strap Watch is rated 5.0 out of 5 by 1. Rated 5 out of 5 by Anonymous from Maurice Lacroix Lovely watch, feels comfy on the wrist, after a few hours I forgot I was wearing it. No need for a battery and very easy to read the time, hope this will last me for years as only had for a short time and I love it already.